An album of songs incorporating Northern humour, the full spectrum of emotions, an undercurrent that references Wiccan dark arts (a modern form of Paganism) and a cover which features a figure that's part mermaid, part woman, part goat and part some-kind-of-winged-thing is going to go one of two ways. It's likely to be either guttural black metal stupidity for teenagers who cower at the sight of daylight, or it's going to be a slightly bonkers collision of genres and ideas that embraces both humour, weirdness and experimentalism. Of course with a band name like Geese the latter is far more likely, and that's exactly what it is. Hurrah! 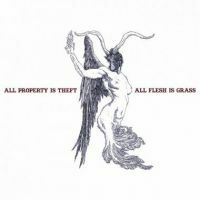 There's no longer a great deal of originality to be found in such a quirky musical approach, but this doesn't stop 'All Property Is Theft, All Flesh Is Grass' from being an interesting and entertaining album. It flits between sounds that you've almost heard before but can't quite place, and few of them are mainstream. 'Location, Location, Apocalypse' nearly sounds like genius idiosyncratic Bristol duo Malakai, 'Pink Guitar', the sole track with a female lead, nearly sounds like Black Box Recorder, most of the songs nearly sound like obscure experimentalists Fort Lauderdale. Pick an inventive prog band from any era. They nearly sound like them too. This record hops around, not staying in one location long enough to pin down. The hazey, tormented 'Mr. Breughel, Hieronymus Is Here' is oddly engaging and then gives way to jazzy folk instrumental 'Can't Find The Way'. Conventional structures and ideas are out the window and the songs take themselves off in whichever direction feels right. 'Acid Mondays' is nearly a normal song. But not quite. Somewhere there's an amazing record shop with a corner dedicated to unconventional, nonconformist records by the likes of Kevin Ayres, Gorky's Zygotic Mynci and the Harvest Records roster, and it's in that corner that this delightful curio belongs.